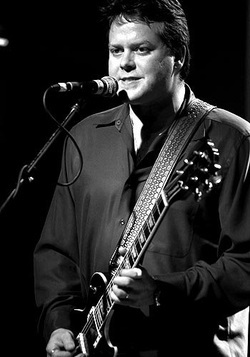 Rick began playing guitar at the age of 16, and by 17 he was playing his first professional gig. In 1991, he attended Music Tech of Minneapolis where he learned jazz and blues from local Twin Cities greats. The early and mid-90s were spent playing in a Duluth-based band called "Blues Debris", winner of local battle of the bands competitions, and opener of the 1995 Bayfront Blues Festival. A chance encounter with a past band-mate at a local club on one of his rare nights off would change the future for Rick in a big way. By the late 90s, he moved to Minneapolis permanently to join Todd in Leep 27. For almost 10 years, they toured the mid-west playing a blend of original pop-rock music and covers. During that time, Rick received 4 nominations for "Best Guitar Player" by the Minnesota Music Academy, along with the band winning honors for "Best Pop Group", and "Best Pop Album". After a brief stint in New York, Todd returned to Minnesota with a desire to get back into playing, but in a more scaled down version of the full band. Rick jumped at the idea, and together they have been playing their unique blend of acoustic material since 2007.